December 15, 2014. 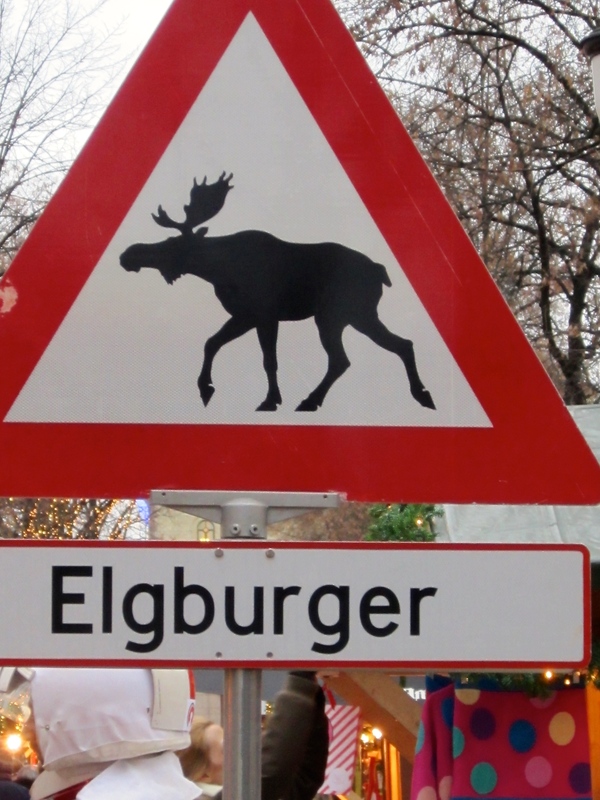 Gotta say, moose are pretty tasty. One night after work, Matthew and I headed over to the Christmas Market on Karl Johan’s Gate for a bite to eat and a little shopping. Three moose burgers later, we decided we liked the stuff. Especially when you wash it down with a little gløgg — a mulled wine made with cloves and cinnamon, served warm with a helping of almonds and raisins. On a tight budget, the drink can easily serve as a meal that’ll sustain you all day. Matthew at the apex of the Sami tent. We sipped our toasty gløgg by the bonfire that was set up alongside the skating rink and watched the Norwegian kids skate the hell out the ice. We’ve considered renting skates and joining them, but these kids are so crazy fast that I’m sure we’d get bowled over in a heartbeat. 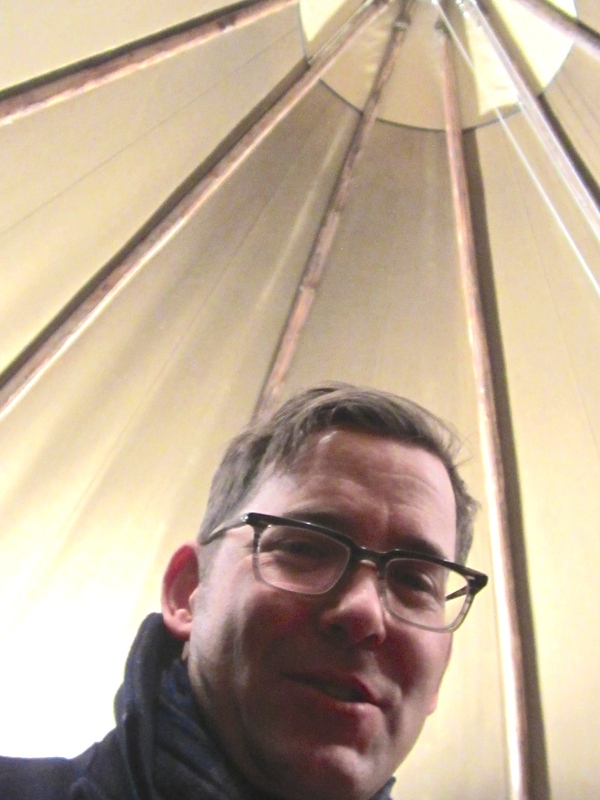 After ten minutes of strolling the nearby stalls looking for Christmas gifts, we decided more gløgg was needed to combat the cold, and we headed into the giant Sami tent. 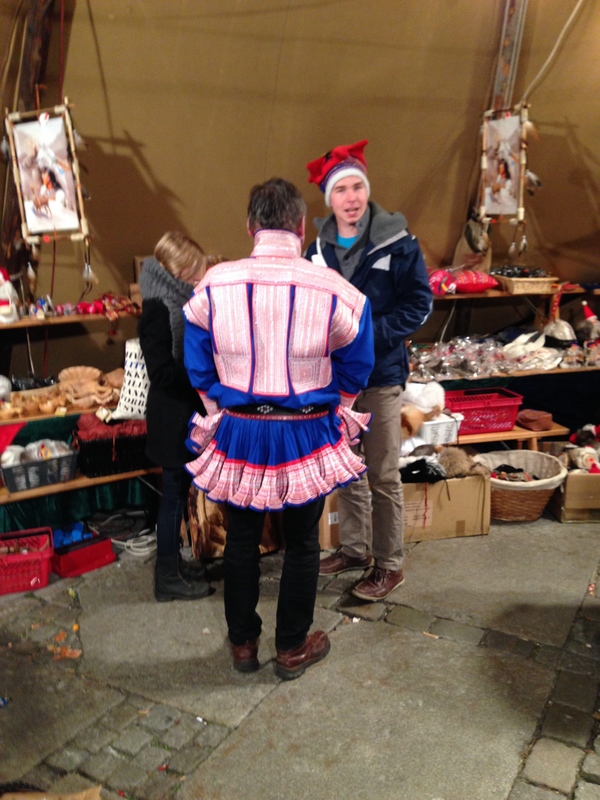 A guy in a traditional Sami shirt. The Sami are traditional Norwegian reindeer herders that live within the Arctic Circle. Each year, they set up a huge lavvu (tent) filled with crafts, clothing, hides, horns, and other traditional items. The tent itself looks a whole lot like a Plains Native American wigwam or tipi, made of wooden poles and hides or canvas. You’ll occasionally see these tents in people’s backyards, and there’s a store nearby the market that sells them, some beautifully decorated with airbrushed art. Our goal is to go to the city of Tromsø, where you can stay in one of these tents and ride in a sleigh pulled by reindeer, so keep your fingers crossed for future adventures. 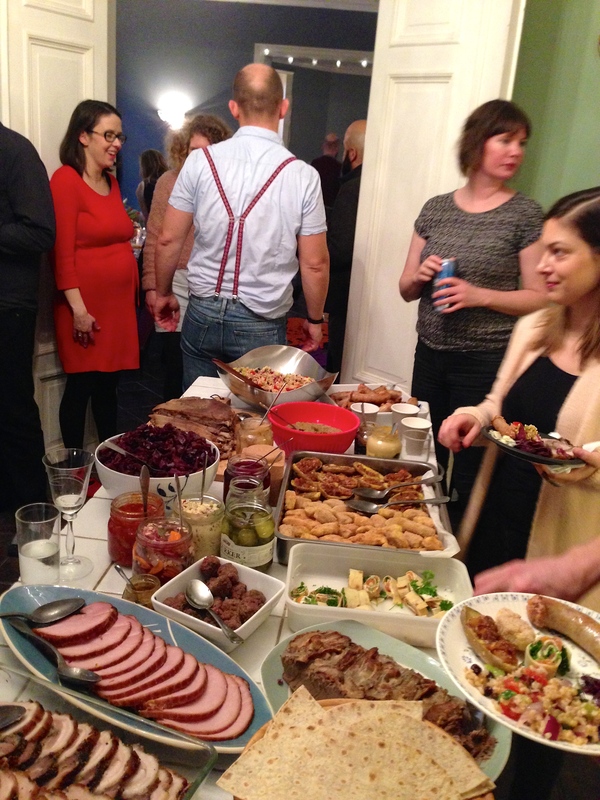 Our scrumptious Norwegian Julbord (Christmas feast). 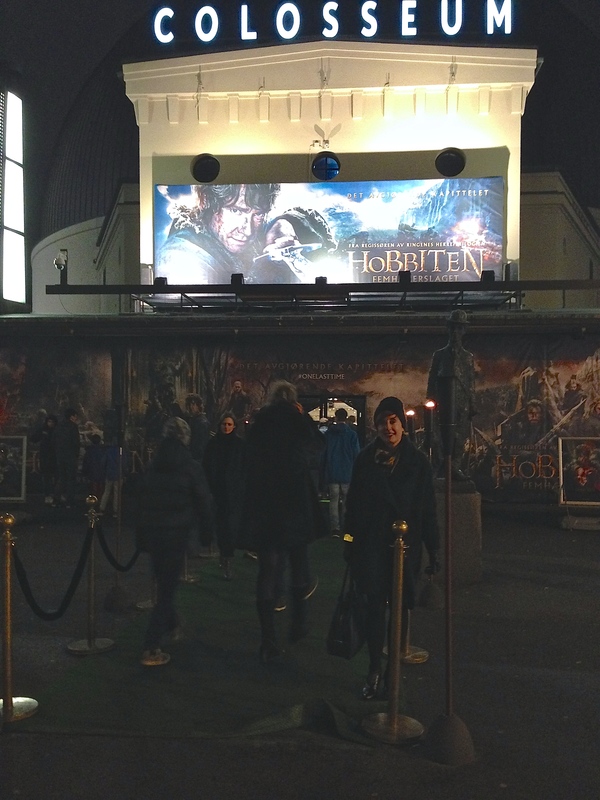 The second event that we had to rush to was, sadly, a showing of Hobbiten (The Hobbit). We would have skipped it except that we were meeting friends and had bought the $25/per person tickets a few days before, expecting that the party would be over by the evening. Oops. Despite my cluelessness, my hostess was welcoming and lovely, never mentioning my mistakes, but I felt like a real rube later when Google revealed my rudeness. Oh well, I’ll know for next time … if there is a next time. Given my height, I’m welcomed by the Colosseum’s hobbits as one of their own. In any case, off we trudged to the Kino (cinema). I’d seen this word on buildings and wondered why Norwegians were so into a card game that they had whole facilities dedicated to it. Turns out, they do love to gamble, but “Keno” isn’t really their style. Anyway, the particular Kino that we were headed for is the Colosseum. It’s billed as the largest cinema in Northern Europe and has a domed ceiling that measures the same diameter as St. Peter’s Basilica in Rome. I have to say, it’s a pretty impressive facility. The red-carpet-rollout-and-velvet-ropes routine is standard for every movie. Torchlight, an entire Hobbity stage set, and a statue of Charlie Chaplin (not sure of the significance here) greeted us at the entrance. Inside, the staffers consisted of elaborately costumed Gandalfs, Arwins, and Frodos. The only thing that was noticeably different from an American theater were the concessions stands, which featured huge walls of heated or refrigerated cases with boxes of popcorn, bacon-flavored pork rinds, bottled sodas, and candy — a bit like a giant vending machine with no opportunity to add salt or butter, or mix sodas into unique concoctions. Guess I’m too used to my fountain drinks and freshly popped treats. In any case, if you ever get the chance, seeing a movie under the big dome here is really fun; a bit like sitting in a planetarium. Just be sure to buy a ticket online beforehand — as with dining out or seeing a play, reservations are required and seats are assigned. Giant vending machines of popcorn and pork rinds. Norwegians love their candy. The movie theater has about four of these giant racks.